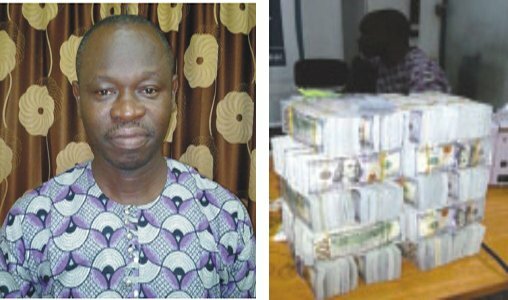 The Economic and Financial Crimes Commission(EFCC) yesterday said it had traced about $2.1million (N413million) seized at the Murtala Muhammed Airport in Lagos to a former Executive Secretary of a federal parastatal.The commission said it might be forced to declare the man wanted if he does not show up for questioning. The agency said all attempts to locate the man in Lagos and Abuja proved futile. The National Drug Law Enforcement Agency (NDLEA) on July 3 arrested a bureau de change operator, Mr. Ibiteye John Bamidele,(above) at MMA Terminal 2 (MMA2) Lagos with the cash. The Head of Public Affairs, NDLEA, Mitchel Ofoyeju, said Bamidele was arrested by anti-narcotic officials, who suspected that the cash was to be laundered. The NDLEA handed over the suspect to the EFCC on July 8, following his confession that he was on money laundering errand for the ex-official.It was, however, learnt that all attempts by the EFCC to interrogate the suspect had failed. “The EFCC has finalised a plan to declare the former parastatal’s chief wanted, over a $2.1million money laundering case. “The anti-graft agency has been on his trail for weeks, since a certain Ibiteye John Bamidele named him as the owner of a $2,198,900 haul, recovered from him by men of the National Drug Law Enforcement Agency, NDLEA. “Ibiteye was arrested on July 3, 2015 at the Murtala Mohammed Airport in Lagos by the NDLEA and handed over to the EFCC on July 8, for further investigation.